DOT's ##http://a841-tfpweb.nyc.gov/jackson-heights/map/?zoom=16&lat=40.74826&lon=-73.889&layers=B0FFFTFFTTT##new interactive map## of Jackson Heights can display several layers of information, like the number of traffic crashes and pedestrian volumes at certain intersections. Since 2009, the Department of Transportation has been engaged in a major study of Jackson Heights’ streets and sidewalks. At the request of community groups and with federal funding from Rep. Joe Crowley, DOT has been developing a plan to make the neighborhood safer, less congested, and more transit-accessible. After two years of research and community engagement, DOT will be presenting its first recommendations next Saturday, February 12. In preparation for the release of those plans, DOT has also launched a first-of-its-kind data portal collecting all the information about the Jackson Heights Transportation Study. (The portal was developed by a division of OpenPlans, Streetsblog’s parent organization.) Everything from community board presentations to raw, block-by-block data about parking occupancy is in one place. 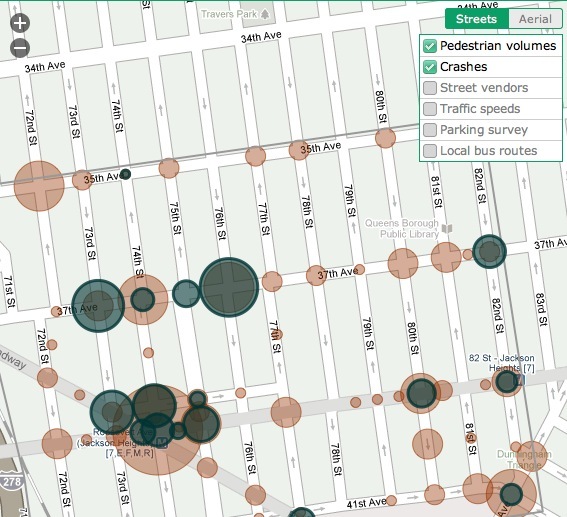 The portal includes a new interactive map of Jackson Heights. Presenting information like vehicle speeds, pedestrian volumes, traffic crashes and parking occupancy, the map helps visualize what happens on the neighborhood’s streets. You can see, for example, how rampant double-parking blocks buses along Broadway: On one block, there are an average of 32 percent more cars parked than there are spaces. According to DOT, even more features should be available after next Saturday. What’s presented on the 12th could also be extremely exciting. At presentations to Community Boards 3 and 4 last June, DOT proposed classifying all neighborhood streets into four categories laid out in the department’s Street Design Manual. Through streets would be redesigned to move vehicular traffic more efficiently, without causing speeding. Transit streets would have bus lanes, curb extensions at bus stops and lights coordinated with the buses. 74th and 75th Streets are likely candidates. Slow streets would calm traffic with re-timed signals and traffic-calming treatments like neckdowns. Some streets could be pedestrianized, with furniture and greenery creating new public spaces. On top of that, DOT is looking at using curbside space more efficiently by adding more parking meters and extending metered hours, adding delivery zones for commercial vehicles, and using PARK Smart to price peak-hour parking more effectively. They’re also considering adding bike lanes and bike parking in the neighborhood. Several ideas in this vein have been bubbling up through community-based efforts like the Green Agenda for Jackson Heights, a blueprint for making the neighborhood more sustainable released last spring. All these possible improvements are only Phase I of the project, meaning they’re considered short-term improvements. Implementation would begin this spring. Phase II will explore larger improvements requiring either capital construction or more intense coordination with other agencies. Of course, an ambitious list of potential improvements doesn’t necessarily turn into ambitious implementation. We’ll find out on the 12th. This type of data availability will do wonders to improve DOT’s credibility. If anyone has a problem, DOT can simply say, the data is online, go and check it out if you don’t believe us. Also, most people don’t have time to sit through community meetings to see presentations, so this really should be standard on most projects. While I offer several criticisms below, let me note up top here that I applaud DOT’s use of maps. A great first step. Congrats. 1. But this DOT map is as interactive as the one in the World Atlas my parents gave me in 1959. There I turned the pages rather than clicking button. I suggest we reserve the “interactive” map term to those that enable user alteration. Perhaps this might better be called a “layered map.” And note, DOT does not refer to the map as interactive. It does not display speeds on my machine. 3. And as a resident of the community, there are glaring errors: 75th Street north of 35th Avenue is never slow. And 73rd street south of 35th avenue is nearly always slow. 4. And looking at the raw data – http://a841-tfpweb.nyc.gov/jackson-heights/files/2010/12/traffic_speeds.txt – it lacks meaningful meta. But again, good to start the journey.